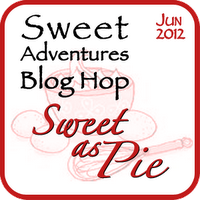 When the theme “Sweet as Pie” was announced for this months Sweet Adventures Blog Hop hosted by KC of the Capers of a Kitchen Crusader… apple pie came to mind. Warm apple pie with a dollop of fresh cream… delicious! But after giving the theme some more thought I started thinking back to my school days… my favourite subject… home economics. 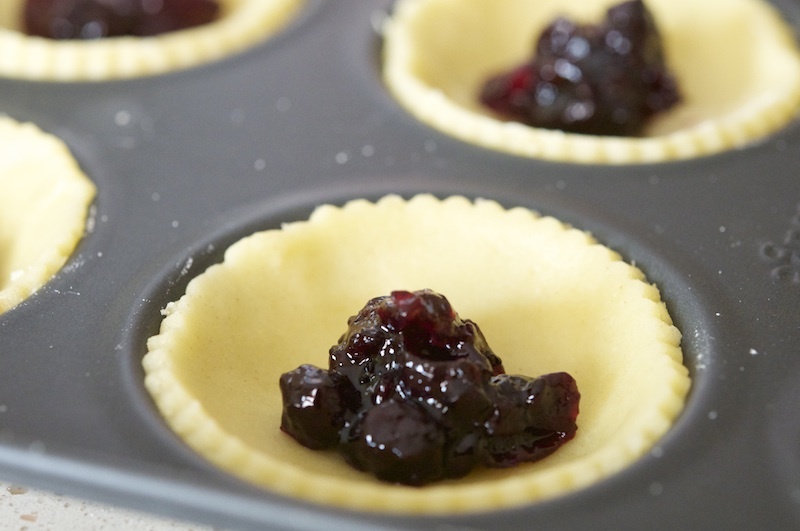 I remembered these “little jam pie cakes” baked during one of the cooking lessons but I couldn’t remember what they were actual called. They were a cross between a pie and a cake with a jam filling. But I do remember that I loved baking them and did so on many occasions during those years. Update: 2015 🙂 Happy to announce that my sweet as pie Welsh cheese cake photograph is published in the new edition of Essentials of Living text book for Irish Students. Not so long ago I acquired two old Irish cookery books called “All In The Cooking” from my mother (no way were these gems going in the bin) which Mum had used during her teacher training days at college. The cookery books were official text books compiled for students and classes of Domestic Science in Ireland and printed during the 1940’s and 50’s. 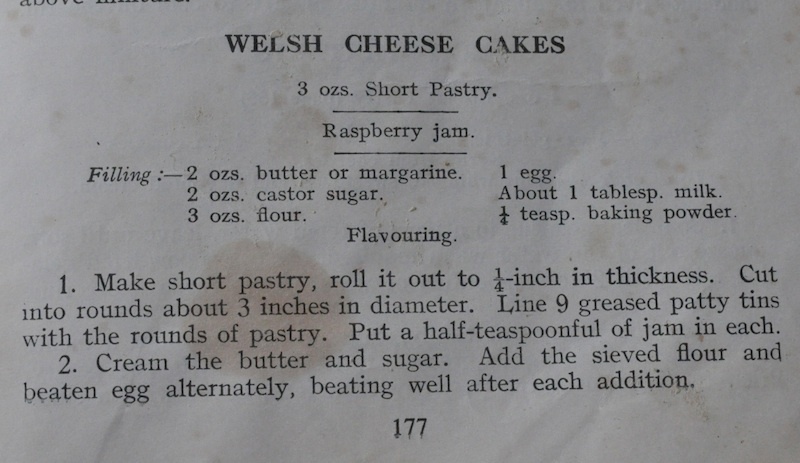 Flicking through the old yellowed pages and scouring over the recipes, came across what I was looking for… these little jam pie cakes were called “Welsh Cheese Cakes.” Maybe our domestic science teacher called them something different. Why they are called cheesecakes… I have no idea and there is no cheese in them either! But the theme for the blog hop is pies… pastry on the bottom and pastry on the top… well these Welsh Cheese Cakes fit the bill. This is the first time I have baked this old school recipe for my family and once the camera was set aside (although I got the first bite), the cakes were eaten and the family statement was “why have you never made these before”… home baking at its best! Some notes: As I used a 12 hole patty tin more pastry was required, the pastry weight stated in the orignal recipe seemed on the low side anyway! Rolling the pastry into 1/4 inch thickness was a bit on the chunky side for me so I went for about 1/8 inch thickness, a little more delicate! 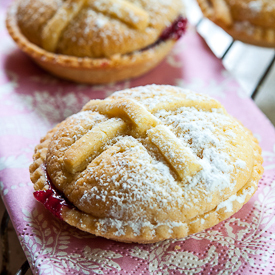 Using a home-made sweetened short crust pastry was also a preference, but when buying short crust pastry from the supermarkets I choose pastry made with butter! When making the cake filling I used the all- in- one method of cake mixing for this recipe, which is quicker, rather than the creaming method. The cake filling was soft enough when mixed so I omitted the milk and used vanilla extract for the flavouring. Pre-heat the oven to 350°C/180°F/160°C Fan/Gas 4. On a lightly floured work-surface roll out the pastry to 1/8 inch thickness. Cut into 12 rounds using a 3-inch round fluted pastry cutter and line the un-greased patty tin with the pastry. Re-roll the scrapes of pastry out into 1/8 inch thickness and cut pastry into thin match-like strips, you will need 2 strips per cake. 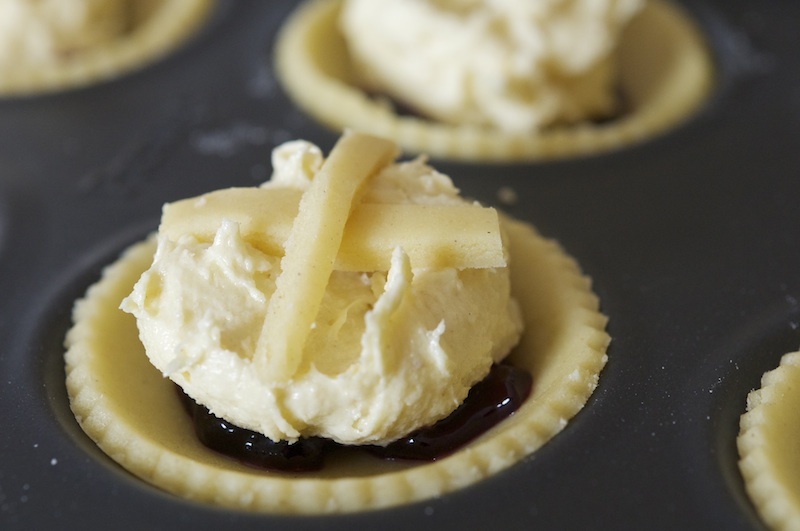 Place a 1/2 teaspoon of jam into the middle of each pastry round. Place patty tin into the fridge (especially if the kitchen is very warm) while making the filling. Put the butter into a medium mixing bowl and sieve in the castor sugar, flour and baking powder. Next add in the vanilla extract and egg. Beat all the ingredients together using an electric mixer for about 2 minutes or until mixture is smooth and lighter in colour. 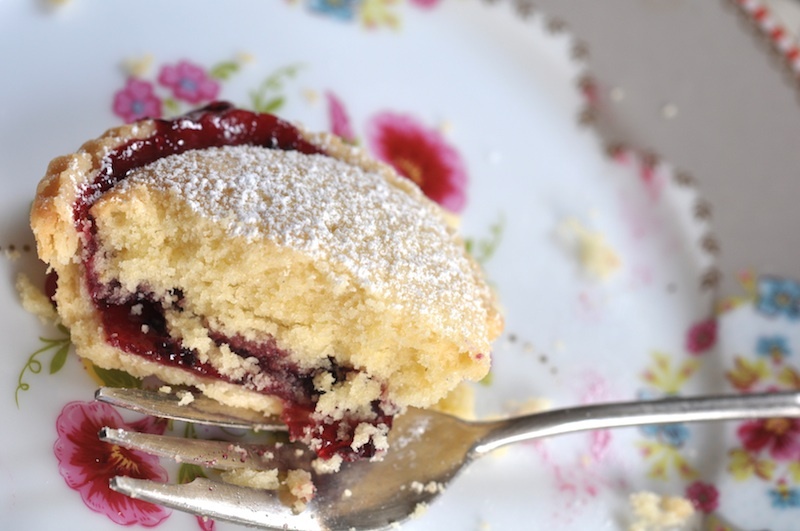 Place 1 heaped teaspoon of cake mixture over the jam, then cross two strips of pastry over the top of the cake mixture. Bake for about 18 to 20 minutes or until light golden. Leave to cool in the tin for about 5 minutes before transferring to a wire cooling rack. Dust over some icing sugar before serving, if using. This post has been part of the “Sweet Adventures Blog Hop, click here to see all the other “Sweet as Pie” entries! I love old cookbooks! Feel like I may have already told you this but my husband got me the very first edition of Betty Crocker’s Picture Cook Book (printed in 1950) and reading it is like stepping back in time. Now I’m off to the kitchen to see if I can come up with a pie creation myself before the hop ends! Yours look very tempting! 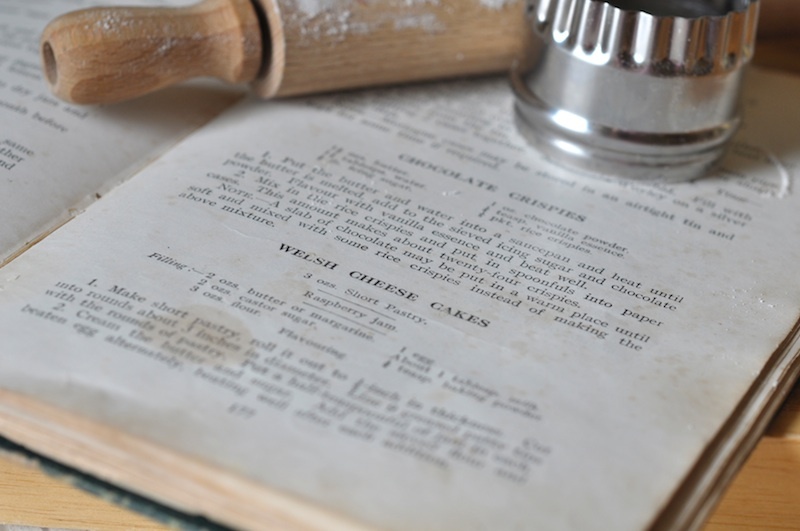 Old recipes are my favorite and these Welsh Cheese Cakes look really homely! Does the pastry crisp up or is it quite soft when baked? Isn’t it funny about recipe names sometimes? I made a sponge cake today called Pinch of Salt Sponge Cake but there is no salt in the recipe, either! lol. These look fantastic!! I love vintage recipes too (actually I like to read recipes for fun!). Funny about the name. It’s kind of like Welsh Rabbit – isn’t that made with cheese, not meat? Thanks for the recipe Moya! And the awesome photos! Such cute little pie-cakes! I wonder why they’re called cheesecakes? Looking at the first photo I thought that there was pastry on top but it was actually cake. Love the combination of pie and cake. I’m in love with these. I love those old fashioned recipes with simple ingredients that easily turn into something delicious! I did some searching after I read your post and still can’t find out the reason for the name. I did see the post that original welsh cheese cakes were made without cheese.. but that doesn’t help! Oh my God!! I made these from a Woman’s weekly when I was like 12 and have craved them recently. I googled ” sponge cake jam and shortcrust pastry” and got this page. Thank you soooo much for the recipe and the name. This made my day. these cheese cakes look delicious and they are so cute! Here in NZ they were/are known just as Cheesecakes. My maternal Grandmother, Nana, used to make them using plum jam she’d made from her home grown plums. These little wee cakes are such a happy memory! I am so thrilled to find the recipe for these here!! I’ve been looking for how to make these for ages. My aunt used to make them for me all the time when I was in Ireland. I watched her make them once and tried to write down all the ingredients but didn’t get all the measurements correct. I love these little jam cakes and have missed them greatly. Thank you so much for posting the recipe! This appears to be just what my auntie used to make. My mother used to make these when I was growing up in Dublin. They were the first sort of “cheesecake” I was ever exposed to. I don’t remember ever referring to them as Welsh but it was 40 years ago so maybe we did. Thanks very much for posting the recipe. Wow! My (Welsh) Nan used to make these when I was little! She always called them ‘Maids of Honour’ but no idea why, never heard of the name Welsh Cheesecakes! Haven’t had them in years so am going to make some very soon, thanks for the reminder.